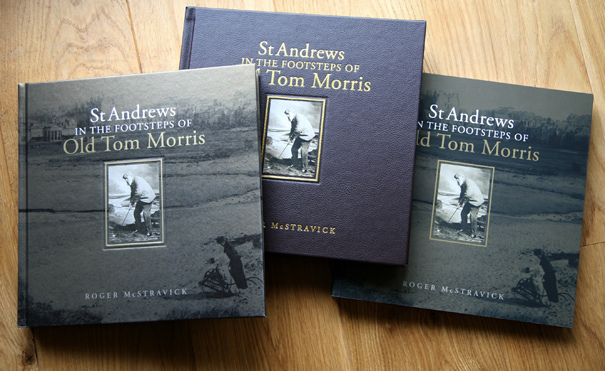 Since its launch during The 2015 Open at StAndrews, the book I designed for author Roger McStravick ‘StAndrews in the Footsteps of Old Tom Morris’ has received enormous critical acclaim from the golfing world and beyond. Amongst them: “In over 160 years of golf books written about StAndrews, this is the most beautiful and informative. An instant classic and thoroughly recommended.” Chris Jones, Editor of Golf World; “A true golfing masterpiece.” Jim Black, The Golf Paper; “A sublime and highly researched book.” John Hanna, British Golf Collectors Society; and “a book for the connoisseur” Jim Davis, US Golf Collectors Society. High praise indeed. However, it still came as an enormous surprise (and delight) to us when it was announced by the United States Golf Association that the book had won the coveted Herbert Warren Wind Book Award for 2015. This award was established in 1987 to recognise and honour outstanding contributions to golf literature while attempting to broaden public interest in and knowledge of the game of golf. “An outstanding achievement and a major contribution to the literature of the game. The level of research undertaken to breath new life into this subject is extraordinary. McStravick’s writing, along with the previously unseen photos of StAndrews, Old Tom and others from that era, make this a magnificent, one-of-a-kind book,” is how Director of the USGA Museum, Michael Trostel summed up the book’s achievement. 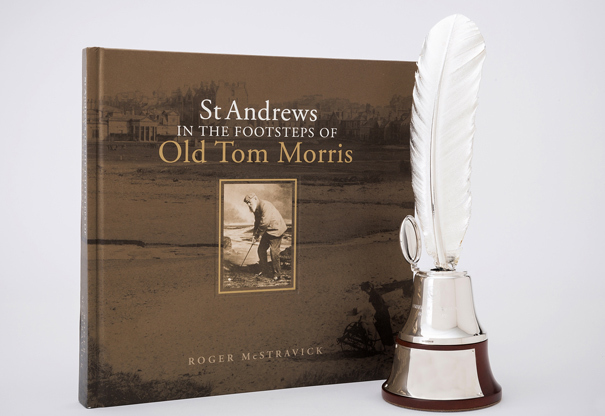 This is the second book I’ve had the privilege of designing that has won the Herbert Warren Wind Book Award, the first time being in 2008 with the definitive book on Old Tom Morris, ‘Tom Morris of StAndrews, The Colossus of Golf, 1821-1908‘ by authors David (Doc) Malcolm and Peter Crabtree. Needless to say say I’m deeply indebted to David, Peter and now Roger for allowing me the opportunity to work on both these magnificently researched books. These are certainly two huge milestones in my book designing career so far. Roger took three years to research, write and find the images for the book. For me it took 6 months of long days, from January to June 2015, to ensure we got it printed and out in time for the 2015 Open in July at StAndrews, when it was officially launched and available for sale that week within the Open merchandise tent and from all the StAndrews bookshops. The book itself contains over 350 images, mostly of old StAndrews, prominent people of that era and famous visitors to the town. Many of the image originals were in a poor state, hence I can truthfully say that each and every one of them has been retouched by yours truly. It became a labour of love and, whilst we had a very tight deadline, it was a case of ”I’ve started, so I’ll finish”, getting every scratch and glitch off those old photographs and restoring them all to their best possible condition for the reader to appreciate. It took many late nights and early rises to meet that deadline, but it was well worth it. There are 3 editions in the set. The 79 Edition (£395) is a case bound leather edition limited to 79 copies, this number being the lowest score that both Old Tom Morris and Allan Robertson scored over StAndrews Links. The Collectors’ Edition (£295) is a case bound Wibalin edition, limited to 300 copies. Finally, the 1821 Edition (£60) is a soft back edition, with a soft feel lamination, limited to 1821 copies, 1821 being the birth year of Old Tom. 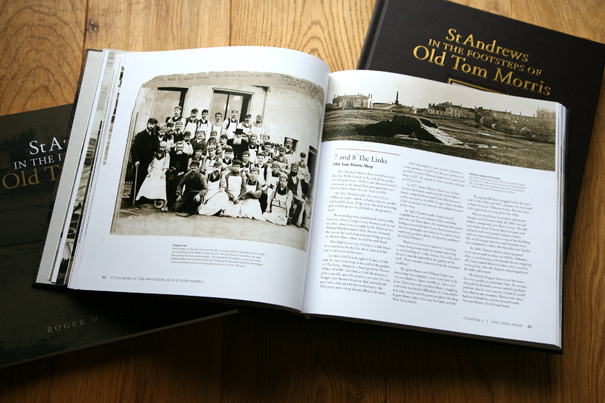 The book chronicles life in StAndrews during the era of Old Tom Morris (1821-1908) and examines the important role that Morris and others played in securing the town’s reputation as the ‘home of golf’. 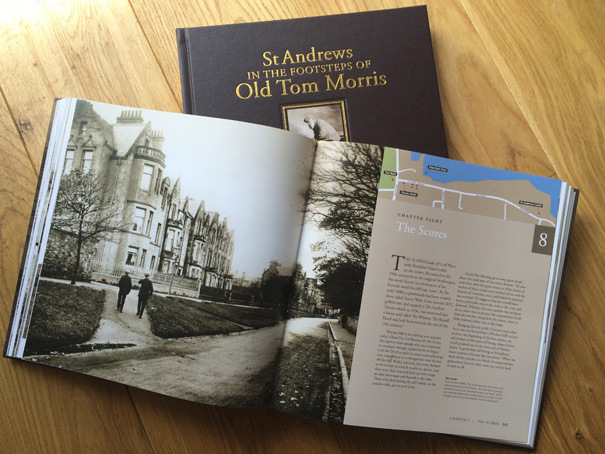 It also take you a trip (with maps) through the streets of StAndrews, relating the stories and significant homes and buildings of the town in those days. Having read the book at least six times during its artwork, corrections and proofing stages, I can truly recommend the book as a great read, of interest to more than just a golfing audience. The Foreword was very kindly provided by His Royal Highness, Prince Andrew, Duke of York. Each book is 296 pages measuring 280mm x 280mm and all the hardbacks are signed by the author. But please hurry if you want a leather or wibalin book as numbers of these are dwindling as I type.